It’s very important to come up with a good website name. Something that you can not only relate to, but that’s easy to remember, easy to type, and something that cant be mixed up with another moms site or product. In addition to that, naming your website is in direct relation with how your site comes up in search engines. Lets say that you own a hair bow site and you call it myblingthings.com and someone else owns a site that is “hairbowsincorporated.com” . If someone types in hairbows, the other persons site is more likely to come up because hairbowsincorporated.com actually has the keyword in it. Assuming your site is optimized and has been submitted to search engines, you will be in the listings, but not as high up. Where your site comes up in search engines has a direct relation to how many sales you will get. Basically bringing in the customers actually gives you the chance. When I first went on my name journey, I consulted a group of friends who spent just over an hour coming up with cute names and vetoing names for me. It was important to me to use the word ballerina in my name, not only for my love of ballet, but because my design is replicated after a ballerina dress. But for awhile, i nearly became ThePoshSpot. Good thing I didn’t, there are about a million people who use the word Posh in their domain name. I may never have been found! I also had a hard time finding something that on one else had and not to mention a few domain names I used to use, I had let expire, and someone else picked up…so, there ya go. Then someone said Bambina! We were trying to think of words that invoked little girl or children, without directly saying that. And thus, www.BambinaBallerina.com was born. Woo, hoo! I had a name. Whew! It wasn’t a name that had a keyword in it, but in all fairness, that was something I learned after the fact. I did go out and buy www.Ballerinahairbowholders.com as well, so I could redirect it to my site and have a keyword in it. If you have ever seen companies advertise getting you to the top of the search engine, this is one of the tricks. They reassign you domain names and forward someone to your site from that name. Google doesn’t really like you to do this, so be careful, it can harm your page rank if you overdo it. One thing that I can say is that my name is easy to remember, is never confused with another mom site or product, and is catchy. I guess you cant win them all on the keyword thing. I did optimize however, Ill teach you how to do that in a later post. When you go buy a domain name, there are so many places to buy it at. Really, just take the cheapest one. There is nothing special about where you buy your domain names at. Sometimes your hoster will INCLUDE your domain name and register it for you for a reasonable fee or as included in your hosting package, but make sure they don’t OWN your name if you decide to cancel or change hosters. Since I never wanted to mess with that, I just keep all my domain names in one spot and under my own care. I DONT RECOMMEND BUYING THROUGH GODADDY!! It can be a real big hassle to move and set up and they are not overly helpful. I get mine from Blue Host and its pretty easy once your logged in. You can forward your domains (to another page), set up your nameservers when your hosting kicks in, park them so they are not being used, or host them right there. They also offer a bunch of other services that I don’t particular need, but its there if I ever change my mind. What I do is keep a separate email address to file important paperwork like this. I have an extra email account that I forward all my files to and put them in saved folders. I don’t email out of that account at all, its only for saving. All my hosting information, wholesale inquires, business contacts, and passwords. That way if I ever need something, I just pop on, cut and paste, and voila! Back in business. A real quick update on hosters. I have been in and out of three boutique hosters. I was on a boutique hoster that was run by some girl in her house that was listed as a “reseller”. While there are many honorable resellers, this one wasn’t. What a reseller does is take your payment and host a resell account and sell part of her space to you. She didn’t pay HER bill, which means every website on the account went down. Including mine. Unlucky for her, I am a whiz at computers, tracked her down by her domain name, found out she lived in my CITY, and drove to her house. That was the shock of her life. Once I had my site files back up, I moved them to a new hoster and have been there for almost 2 years. This hoster (PappaShop) had been good but recently I was hacked twice and when I talked to them about it, they insisted I was not hacked when clearly I was. Just because they could not find it, doesn’t mean it hadn’t been hacked. I had “Viagra” keywords and descriptions in google for my site, which is a known hack that redirects google bots to produce keywords for another site. It took me about 8 hours to fix it, on my end, and they were NO help. It was talking to a child. I should never know more than my hoster, right? As soon as I got it cleaned up, it got hacked again not 2 days later. Both in the hosting files on their end, so I wont take it anymore. 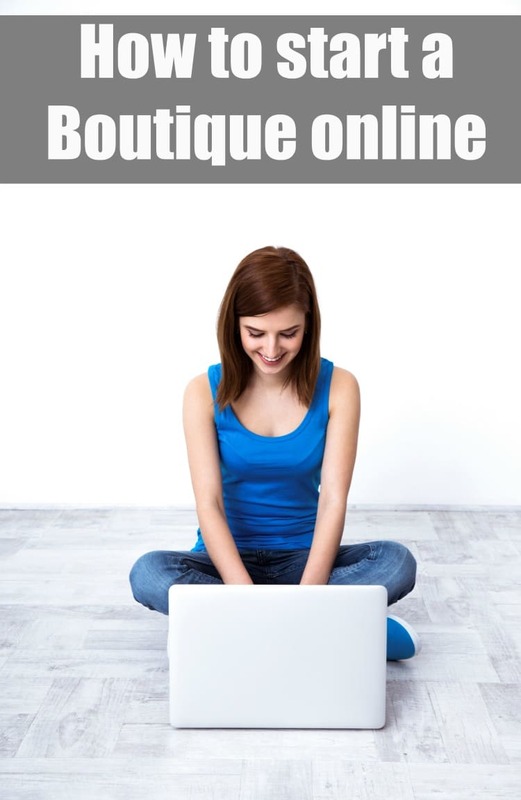 You can get some inexpensive hosting here for a blog or research other online boutique sellers depending on your needs for set up for the e-cart. So now you have your domain name, now you have your hoster…where do you go? Armed with your new name, and your hoster…here is the fun part. How the heck do I build one of those cute sites with all the graphics? Chances are, unless your super HTML computer literate, this is one of those things you will need to go straight to someone else for. Your hoster should have a few in your system already or for a very cheap price, but quite honestly, they are all usually pretty plain and boring. What you have to find is a website builder that incorporates your personal style and what you are trying to portray. Do you want it to be bright and happy, fun and funky, super feminine and girly, shabby chic, modern…there are so many excellent template designers out there that you will have your pick of the litter. Templates come in several ways. You can buy a pre-made which is a template that someone has premade for you..it will include all graphics/backgrounds, usually a matching banner, and they will upload it straight to your hoster including all necessary text changes (ie Site Name) added into your site and on your banner. Premades will be the cheapest templates out there, because they resell them over and over again. Meaning that any person can come on and buy the same background for their site. In all honesty, I have only come accross a few sites that have the same background, so if budget is a main concern, don’t be too worried about purchasing a premade. They vary from about $15-$50 in cost. The second template you can buy is a Limited Premade…its the exact same thing, except it will only be sold a certain number of times. I see max of about 10 on this on many of them. Your chances are lower in running across this background online. Third, you can purchase a OOAK, which stands for One Of A Kind, which means no one in the world will ever have your exact design. You buy it, its yours, the end. These are gonna run from about $100-$500, depending on how extensive the graphics are, the quality of work, and the fact that they are only sold once plays into the cost. They can also run higher then that if they include java. Last, you can purchase a Custom Design. Meaning that you get to design your own design, ground up. You work with a designer to make your ideas come to life, and these will be varying in cost on what the designer charges and how much time it includes to build your site. Along with purchasing a template, most designers offer ad-ons that include matching Ebay and Etsy backgrounds, business cards, all sorts of banner sizes, and blog upgrades. Truly you can have a whole community that belongs to you! Here are a list to get you started! Just click on the graphic (we endorse Boutique Mama). You can read the girly boutique template designers that I like the most in an article here. If you are starting a store or interface with WordPress, which as great SEO, you can use this inexpensive hosting here. One last thing..these designers barely scratch the surface of the amount of template designers that are out there, so just find one that fits your style, email them if you have any questions before you purchase. Most template designers only work with specific hosters, so double check that they work with your hoster and that the template will fit if you purchase it. (another reason to go with known hosters!). If you visit a site and really like the design, you can usually scroll to the bottom of the page and see who designed it. Generally it has a link, so you can click and go straight to the designers page and maybe find something that also fits your style. My tips with a template is to find something that is easy on the eyes, flows on the page nicely, and is just “you”. There is nothing worse then advertising your site and taking a step back and saying..wow, I just cheaped out and this is U-G-L-Y. Think of the sites you visit..do you like them clean, bright, soft, modern, and what makes you decide to buy. Do you trust a site that is unorganized or all over the place? I know that I trust a site that is put together and has some effort behind it. So your initial investment is about $70. Keep in mind that you won’t have to renew your domain name for a year or your template ever unless you decide to completely change styles. If you are just looking to work from home and not sure if you want to sell, consider doing surveys and research. The world of online branding is absolutely huge and you CAN make money from doing surveys. No, you will not make millions, but if you register with the following sites, you will get surveys to complete and it adds up big time. I use this money for new products for my kids and sometimes get enough to even pay my car payment! You can register by checking them out and see what fits for you. Surveys are easy and registration is free! Inbox Dollars: Inbox Dollars pays members to read emails, take surveys online, play games, and go shopping! New enrollees also receive $5 just for joining so this offer will convert extremely well to a broad based demographic, especially users interested in freebies, surveys, sweepstakes, discounts, or coupons online money making opportunities. e-Poll Survey Panel: Express yourself! Take Surveys with E-Poll & Earn Rewards. Sign-up now to be entered into the $1,000 Monthly Draw! Earning Station: EarningStation provides you with the easiest way to earn gift cards online. With our high-paying surveys, discount shopping offers, and other fun ways to earn- You choose how you earn. Minds Pay: Joining is free! Sign up today to get immediate access to paid offers. Evaluate products and services of your interest and give us your feedback. You get compensated! Watch your account balance grow, then you can request a payout! Inbox Dollars: Inbox Dollars pays members to read emails, take surveys online, play games, and go shopping! New enrollees also receive $5 just for joining!! Panda Research: Participate in Offers and Surveys with Panda Research and Get Paid up to $50! Survey Rewards: Search for Rewards and points from shopping! Sign up now and get 250 free points, redeemable on Amazon! Valued Opinions: Don’t give your opinions away get paid for them. Vindale Research: Get Paid to Review Products! Join the finest minds in consumer research and change the world one product at a time. Share your unique opinion and get paid for it! Participation required. Hello I’m just now getting started do you guys consider I start off with dropshipping? Dropshipping can be a tempting thing to consider when you are getting started but you may want to consider keeping control of this integral part of your online business early in startup. Customer service and seeing and feeling the product is crucial in building a trustworthy relationship with your clients. Maybe you start with control in house and slowly outsource and drop ship as you grow. Just my thoughts. We offer drop-ship service for women’s clothing and jewelry. We don’t charge drop-ship fee nor transaction fee. Contact me if you are interested. How do drop ship works? Hi I am looking Into an online kids clothing bouquet. Where can I go to get a website started and would anyone suggest a good wholeseller? I am all new to this but excited to get started. Hello! I own SweetPeas and SugarPlums and offer wholesale sewn boutique tutus as well as lace rompers, legwarmers and bloomers. I have supplied boutiques with these items for over 4 years- but just took the jump to my website. Please feel free to e-mail me if you have any questions! Hi I am trying to start a business online it’s overwhelming. I could definitely use a little help if anyone is able or willing to. Patrice- Did anyone ever get back to you? I would love some help and advice as well. Very overwhelming. still not understanding what a hoster is? I have my website under construction, but you are saying for an online business I need a hoster too right? Sorry…technically behind here! What a great post! We just rebranded our online boutique after starting from scratch with a “so so” name. Getting the name right the first time is HUGE!! My wife has always been into fashion and always talked about one day opening up a clothing store; however, the initial investment and our town we live in is the reason we decided against that idea. So, she then came up with this idea, because the initial cost is a lot cheaper and she could reach out to friends and eventually others that live away in other places! Any help and/or suggestions would be greatly appreciated!! Thanks. Hello! I just got my business lisence and am hoping to get an online womens boutique started within three months. Can anyone give me advice? I am looking into local trade shows but am looking for small wholesale sites also. I would also appreciate input on a good budget for my initial investment. I LOVED this article, it came just in time because I’ve just finished my online store–I designed it myself, however, I have been having a hard time trying to figure out the LEGAL side of all of this. I’m only 21 and definitely did not go to college for this haha. Do I need an LLC, EIN, TAX ID NUMBER or any of that?? Also, could you-in short- explain how to process taxes with an online store? I can’t find any articles about it and I would love not to get in trouble by the IRS so I want to make sure I have everything right before I publish it. This was very helpful!!! Thanks… DO ANYONE KNOW OF A WHOLESALER THAT CATERS TO YOUNG ADULT?? How can I find got wholesaler for my online boutique ? Great post. Except you may want to take oneswankychic or whatever that was off of your site for web designers. I clicked on it and the picture of the naked women was not good. P.s this article is great!!! Was wondering if I could email you on getting some advice on opening an online boutique as well? Any help would be greatly appreciated!!! Thx! This is great information. I’m happy to have found this site as I am researching into starting an online boutique since I have a 1-yr old and I am really apprehensive about returning to admin work. It’s good to have people available and willing to help. I love dispensing helpful information. It’s a feel good and a good way to build helpful networks. I am starting the same website. I am currently working with a few dropshippers at the moment. I’ll let you know the reliable ones and VIP pricing. If you don’t mind, id I’m thinking of staring an online boutique also. I really need information on drop shipping if its not too much trouble. I just decided to look into this a few days ago and keep seeing the word on different pages so it must be something i need. Thank you in advance and i appreciate you r help. I am working on starting my own online store selling women’s/juniors clothes and accessories. I want to go the drop shipper route as well. If you have any info that can help me, can you please email me at angels [email protected] Thank you. I’m also seriously thinking about starting an online boutique for young adults. If anyone know of reliable drop shippers or wholesalers, if it’s not too much trouble please let me know. My email is [email protected], thank you!! first off let me start by saying that was a very informational article. It helped me out a lot. I just recently became a brand new mom and I don’t want to leave my son at all. So my husband told me to follow my dreams. I love fashion I want to start an online boutique. But I don’t know where to begin; well I didn’t know where to begin until I read this site and took notes. Now I would like to know what steps do I need to know as far as legal advice and how would I access vendors or designers? I am trying to start my own online boutique store, but I am having a hard time trying to find vendors. I have asked around but it is very hard to find someone that will help me, I guess they may be afraid I am trying to take their customers I don’t know. That is not what I am trying to do I just want some advice. Was wondering if you were able to obtain any info that you can pass on? I am interested in starting an online little girls boutique…any info will greatly be appreciated! Do you mind if I email you as well? I am thinking about opening a little girls online boutique but afraid to initiate the process. Would really like to get other people’s opinion regarding legal terms/taxes as such. Thank you! Does your email still work? I just tried it and it would not send. I recently opened a store. My friend recommended a site adorabellawholesale.com. The website is not the best, but I tried out a few styles and they sold really fast. The customer service is great, too! Thanks that really give me hope ! So very much appreciated. Thank you so very much for the article. I want to know how do I add the pictures on my website, also how do I go about adding the ability to purchase ans take credit and debit cards on my website. This was a great article very informative. I am trying to open my own boutique, and trying to decide if a online boutique would be better for a 1st time business owner verus a storefront boutique. Since, I am also a Marykay Beauty Consultant I figure I would be using the same on the go methods to get customers to look at my online boutique. Thanks I love all your tips and insights I just started my website and feel like I could always use room for improvement hopefully it picks up soon. Thank you so much for this article, I have been pondering on whether to start an online boutique, this article was great! I’m most definitely looking forward to this new adventure. Thanks! I know this is an old post, but I am hoping you see this comment and can answer my question. I have been looking at boutique hosts and a ton of them have large up-front fees for “setting up” your shop. Can you speak to that? Thanks! Thank you for the advice!!! Very anxious to start my online business! Have you ever heard of “easy boutique builder”?? Wondering if they are reputable? I would be very careful with those website builder sites. I had a very bad personal experience with not one, but two of them, as they take advantage of women who do not have a lot of technical experience creating a website. The website builders that supposedly cater the WAHMS are the worst in my opinion. They use the lack of website building skills as a weapon and can basically hold you hostage to your very own website. BEWARE! Mothers Love – This article solidified my decision as well. I went back and forth and decided that even if it flops, I can say that I tried. I want to know what type of legal tips can be offered, also. Like registering the company name with the state, obtaining a tax ID number, etc. Thank you!! Omg…Thank you so much for all the informative information. I been look for months for this kind of advice and help tips. I been going back and forth with myself about if I want to do a store front or online business and to be honest now after reading this article I have to say I’ve made my decision. Thank you once again. @ Ashley that is another question I would love to the answer too. What about getting the designer brands into your online store for sale? How do you go about that? You wad a big help! The world need more people like you that are willing to spread valuable knowledge. You surely will be blessed. Thank you so much. Seriously. I was totally floundering in internet craziness trying to figure out the world of online boutiques. I’m just getting started making applique designs and needed a platform to sell them. I’ve always just used etsy or my blog in the past, but it was time for a real website. This was so great! As a fellow mom and business owner, I’m always open to feedback and other lessons learned! Thanks again! thank you thank youuuuuuu.. i been looking/dying for information on how to open my business .. i dont have many people around me with this knowledge, its a blessing . good luck with yours, i do think every store has something special.. i want to treat my customer the way i like to be treat it. with fun,beautiful,trendy and cheap accesories. Thank you so much! This is really healpful. I am just atarting my online business, and have to find ways to set up all things. Your information is so easy to read and understood. Thanks again! TRISHA, THANK YOU…THANK YOU….THANK YOU SOOOOO MUCH!!! THIS INFO IS SO IMPORTANT FOR ME, I’M REALLY HAPPY THAT U SHARE WHIT US. =) U HAVE NO IDEA FOR HOW LONG I BEEN WAITHING FOR THIS INFORMATION…I ASK AND FOR SOME REASON NOBODY HELP. AGAIN THANK YOU SO MUCH!!! I am at the very beginning stages and that is the imagining and dreaming stage. LOL But none the less I want to learn as much as I can about the many aspects of the business of opening an online store then hope to move to a possible store location. I want to keep it simple yet make it stand out and be able to serve the different age groups. It is in retail and accesories and would love to run it with my fiancee and little by little teach our children about the business. I found the site very insightful and have to say THANK YOU!!!!!!!!!!!!!!!!! I never would have known where to start to attempt to get my dream started. I’ve been trying to find useful advice and information on how to open up my own online boutique. This article is by far the most helpful I’ve come across and i would like to thank you for offering detailed advice as well as advice on what NOT to do. My question to you is, did you have to trademark your boutique name before setting up your domain name with dynonames.com? The United States Patent and Trademark website is more confusing than setting up a domain name! As many have said before, I’m in the process of opening an online store. Your article is very well written and has given me a lot of food for thought. Thanks for sharing your knowledge. Also If you have any advice on how shipping works with a online business or what would be the best way to do shipping and who to use. I know they have that if it fits it ships for a low flat rate wonder if that would be a good deal when shipping. HElp please. I am looking to start a online clothing store where I buy overstock then sell cheap on line. Not really sure what rules there are to sell online. I know how to do a website, all business licenses and tax. I was just wondering if there was anything I need to know about maybe rules or something to sell online, if there is any? My friend gave me a place to go build a website it is called http://www.wysIwygwebbuilder.com not sure if this is a good place to build a website if I started? So if anyone has any advice they would like to share to help me understand everything about how selling online works please tell me I can use anything. I’m also trying my hand at an online Boutique and it’s more complicated than i thought,there’s a lot of vampires and sharks if you know what i mean out there.And the hardest thing to me is getting your site indexed,creating all the right meta tags,keywords etc.But i’m not going to give up,when one door is closed many more are open,good luck to all and stay humble and honest. I would suggest doing your own SEO work. I use to own a rahter large online maternity company. I paid clos to 45k a month in PPC ads. The reason being is I never learned how to do seo. I hired a company to do it for me and was paying $1500.00 a month and don’t really know what they did. I have since been seo trained but empower yourself with the knowledge on how to do seo yourself and then if you need to outsource it do so…Also, keywords are important but try to focus on one way links as well. My name is Jennifer and I am an ecommerce consultant. I also build complete online businesses that are ready to go with all the products being dropped shipped. Included in the purchase of our ecommerce businesses for sale are our 10 step consulting process where we work with client one on one taking them through every aspect of setting up, running, and then growing their online business. You actually have my site listed above http://www.pure-ecommerce.com. I appreciate you posting our information and any help I can give you or your followers I am happy to do so. Thank you so much for your advice and info. i am very new in stating an online vary boutique and am looking for advise any witch way i can. you have been extremely helpful. Hi, I read your article, Excellent infromation. I am thinking about starting a online boutique. The only differents is that the clothes are slightly used. How would i go about doing this? I would sell Women’s and children’s clothes and accessories. I would appreciate any help. I dont think 2 domains for one site is overdoing it at all. I own http://www.pureeocommerce.com and http://www.pure-ecommerce.com and have so for years. I have a page rank of 4. It’s like anything else-do it in moderation! Wow this is really good information and I wish I would have found it a long time ago! At the beginging you mention the word “Posh” ggeezz I use it not just once but twice one for my boutique store and one for my blog. But This was still very helpful for other issues I might have. My store is ranked number 3 on google but I have heavy compeitition none the less! Thank you for sharing all this information! Hi. I am curious to know how you go about setting up your payment methods (i.e. accepting credit card, Paypal payments, etc) through your online boutique. Is there a cost associated with this? I have a paypal business account and most online boutique software is plug n play…meaning that you just add your paypal info inside and it does the rest for you (transfers people over and back). The templates that boutiques are made with are pretty ‘smart’ so it takes all the html, etc out of it. I pay a paypal fee as part of setting it up with them. for a while i took credit card payments on another online company and that cost me $50 a year and a part of my fee. It was pretty small though. I no longer take credit cards over the phone though. I have been looking into opening up a clothing shop which stocks designer brands, however due to lack of funds am thinking of opting for an online botique to cut out the rent expense. I have read your blogs and they are indeed very interesting. I was just wondering once i get my domain name and set up my website, how do i go about approaching the big Australian designers to stock my boutique? Also how do you compete with the other online stores stocking the same brands? How much initial stock would i need to buy and would i realy be able to sell it all and make a profit? Just want to know what i will be getting my self into and trying to understand the whole process. i dont work with clothing myself, however you can approach companies online and ask them for thier dropshipping policy or their wholesale. For you, it sounds like dropshipping would be best. That is where you display the product and then once its ordered, you ship the order to them w/ their portion of the payment and they ship to your customer. Domain name is easy..just grab from dynonames.com for $10 and hosting..i use pappashoppe (sp) for my boutique. Its about $12 a month and they have great customer service. I am JUST launching an online boutique : http://www.tealeafclothing.com in late December 2009. It’s been an uphill battle but I think I finally have all my finances and legal stuff in order—That is THE most important thing–my advice is that make SURE your foundation is stable THEN go for it! Make sure you have your DBA, your CPA, your logo trademarked and get a sellers permit and EIN. I am working with various designers and they ALL require an EIN and a seller’s permit ID #. I also found that unfortunately a lot of designers are launching THEIR own sites and they do not want to expand their web presence and since http://www.tealeafclothing.com is ONLINE ONLY (for now), it’s been a struggle to get designers to partner with. Good luck with your boutique! Sounds like you are getting it together. I continue to get bogged down myself with all of this legal stuff. For example, What is a seller’s permit, and how do you get one? Is that particular to your state? Did you have any trouble getting a business bank account and credit card? That is what I am working on now, and the bank requires a Certificate of Existence and Articles of Organization, which looks like it may cost $100. Is there any way around this? Any advice would be appreciated!!! Online laws are different and you need to look per your state. For my bank, i actually use paypal and my own personal credit card for expenses and then fund myself back. Just keep careful records so you dont mix up your personal and business. I am a stay at home mom and in the process of starting a hair bow business. Is Sole proprieter the best way to go or LLC.? Thanks for your help in advance. I think LLC protects your home assets better. hi. im a mother to 2 beautiful little girls! i have also been bitten by the hair bow craze(for over 3yrs now). i love making bows and accessories! as with a lot of mother’s, my goal is to have a successful website so i can be home more with my little angels. (i work 3days a week now outside the home. )The boutique world is where my interest is. I have been reading many articles over the past few yrs on what it takes to build a website, etc..it is and can be overwhelming. since having my 1st daughter (its how i stumbled upon the love of this craft) and now having a 2nd girl, they are my inspiration for continuing this journey. If I could ask for help in renaming my business…i would like to include their names in it somewhere if possible(or something that partains to the fact i have 2 girls). i want creative.something sweet. catchy. my girl’s 1st names are Elizabeth and my baby is Katherine.remember, i sell hairbows and hair accessories, but i don’t want to limit myself to the shoes and such later on if i should choose to sell those items too. i think you have to be happy with what you choose cause once you start branding, its hard to change. Make sure no one else has trademarked your statements or use them in places like ebay, etc or it could get confusing (and legal) for you if you take off. What about paying taxes and registering as a business? I tried opening a store until I learned I need to know the legals first. I’ve had the online stuff down pat, but the LLC, pay an accountant jazz…no. I choose to pay taxes at the end of the year myself….any tax accountant can help you. Just be sure to file ALL your expenses very carefully! Cat ,sure, i can do that! Trisha that is so sweet of you! Thank you! I’m always afraid to ask you because I know you’re a super busy lady. I do have some questions about photographing products if anyone has some expertise in this area. I know how important it is for them to look as good on screen as they do in person I’m just not sure I know quite how to capture it. Good article, venturing into the online boutique world seems like a huge task but you’ve done a wonderful job explaining it. I know I was overwhelmed at first but its actually quite simple once you get versed in it. Good type on the buying another name and redirecting it to, your so good! Cat, ill be glad to help you with anything. I have been running bambina for a year..and it pays my mortgage and then some, so i have learned a lot. Dont hesitate to ask me to blog on a specific topic. I am more than happy to help anyone who needs help starting up! Thanks so much for GREAT tips! I have a friend who is starting her own WAHM business and I have sent her the link to this blog. Wonderful! Awesome! Thank you so much for all of this info. I plan on opening my boutique next year if I can get everything in my brain together. Good tips Trisha. I’ve thought about buying my own domain. We’ll see! Okay…whew…I’m going to have 2 domains for one boutique…hopefully that won’t hurt me too much. Lauren, LOL! I wrote this a bit back before i met you. Ill add you. Right. Google does not like a ton of domain names that go to the same site. They find that cheating the system or rather, SPAMMING the search engines. YOu have to be careful. http://www.hairbowholdersforyou.com, bambinaballerinahairbowholds.com etc and they all go to my one site, google will catch on and eventually punish you. They can even remove ALL your domain names if they get really mad. The part that I’m confused on, maybe I’m not reading it right is this..
Do you mean google doesn’t like your redirecting several domains to one store?